Directed by Hirokazu Koreeda. Starring Yoshio Harada, Hiroshi Abe, Yui Natsukawa. This is a strange choice from somebody like me who’s always attracted by Hollywood blockbusters and Oscar-worthy-type-of -movies. In fact “Still Walking” is a small, intimate and charming Japanese film by the ever interesting director Hirokazu Koreeda. I stumbled across his work, almost by mistake a few years ago with the beautiful (and most moving) Nobody Knows and ever since then I’ve been trying to catch up with his work. Still walking is coming out on a special Criterion DVD on the 8th of February 2011 and if you are into Japanese cinema at its best or small intimate family dramas done with the lightest touch and the most naturalistic approach, this is probably one for you. Anyone else should probably pass on, however, even thought this is really far from the movies I usually watch I did find Still walking very touching and more than 2 weeks after I saw it, I keep on thinking about it. This is one of those films that stays with you, long after the credits have finished rolling. I must confess it took me a while to get into it. The beginning felt a bit too staged. Both the use of static camerawork framing the scenes and the dialogue didn’t seem quite right. The film clearly aims to capture how people relate to each other within a family environment. Particular attention is given to their actions within the daily routine, however some of it felt a bit too indulgent (The preparation of the food for example seem to go on for quite a long time) and take you away from what’s really the key of the story: the interaction between all the character. And that interaction works as a treat! The film is essentially an intimate family drama about a man visiting his elderly parents for the anniversary of the death of his eldest brother, fifteen years before. Behind the lovely summer day, the comfortable house and unchanging as the mother’s homemade feast, everyone in the family has subtly changed. Kore-eda is a master of building a scene that seems absolutely normal but hides something completely different underneath. It’s as if the picture told you something and the dialogue something else… People sit around the table, eat their food, make small talk: everything seems normal in the gentle summer breeze as the static camera frames the action in almost unedited sequences and then all of a sudden comes a line of dialogue (sometimes even off camera) that makes you see everything in a complete different light. It’s all handled with the most natural approach even if not always very subtle. However I must say, I am relying on the subtitles to understand the dialogue, and I am sure those are probably trimmed down a bit too much: some of the nuances are most likely lost in translation. However with my western eyes I found some of the details of Japanese “normal country life” fascinating and almost mesmerizing: all the business of taking off the shoes, or the pouring of water over the tomb stones makes it all look like a complete different world, but then things like the ordering of take away sushi or the little boy mixing sodas in the same glass gives it a strange sense of familiarity. 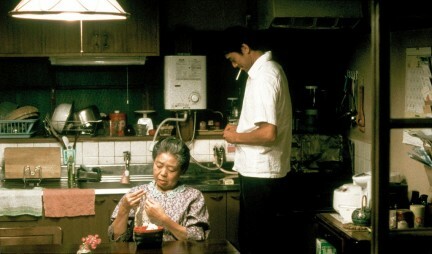 As the film unravels the audience gets closer and closer to each member of the family, starts to hear their thoughts and feel their pain and at the end, the fact that it was a Japanese family is pretty irrelevant. OH, need to check this out, looks pretty cool.